The author of Getting from College to Career reinvents the concept of management for a new generation, offering a fresh and relevant approach to career success that shows them how to make the next step: becoming a leader. We are in the midst of a leadership revolution, as power passes from Baby Boomers to Millennials. All grown up, the highly educated Generation Y is moving into executive positions in corporations and government, as well as running their own businesses, where they are beginning to have a profound impact that will last for decades. Written exclusively for Gen Y readers to address their unique needs, Becoming the Boss is a brisk, tech savvy success manual filled with real-world, actionable tips, from an expert they respect and relate to. Lindsey Pollak defines what leadership is and draws on original research, her own extensive experience, and interviews with newly minted Gen Y managers and entrepreneurs around the world to share the secrets of what makes them successful leaders—and shows young professionals how to use that knowledge to rise in their own careers. 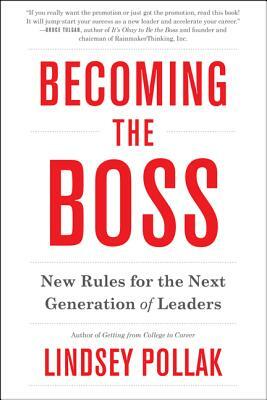 From learning to develop a style that appeals to your older colleagues, to discovering the key trends affecting your career, to mastering the classic rules of excellence that never go out of style, Becoming the Boss helps you identify your next professional move and shows you how to get there. — --Bruce Tulgan, best-selling author of It's Okay to be the Boss, Not Everyone Gets a Trophy, and The 27 Challenges Managers Face; founder and chairman of RainmakerThinking, Inc.